Is Tanning During Chemotherapy Safe? Is It Safe to Go Tanning During Cancer Treatments? Is it safe to go tanning during chemotherapy? Whether you are considering going to a tanning salon, or heading to the beach, there are a few things you should know about tanning during cancer treatment. And while you probably won't be surprised that some chemotherapy drugs don't mix with tanning beds, you may be surprised by how beneficial the sun may be for those living with cancer.. There are special precautions and concerns when it comes to tanning during cancer treatment. Some forms of chemotherapy as well as radiation therapy can greatly increase your risk of burning. But let's first talk about the overall risks of tanning when you aren't going through cancer treatment. 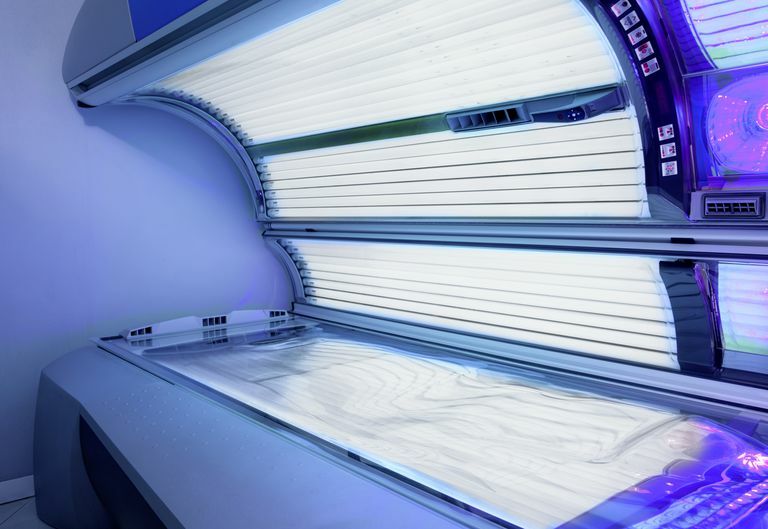 There are a few primary risks to tanning whether tanning is done out in the sun or in a tanning bed. Tanning beds, however, can increase the risk of cancer in only a single visit. In addition to the possible risks and benefits of tanning when you aren't going through cancer treatment, there are several things that you should be aware of when you are receiving chemotherapy. This is worth reviewing closely as not only can the risks of tanning be more serious, but the benefits of sun exposure (or whatever method of making sure your vitamin D level is okay) are even more important than for someone who does not have cancer. In other words, in some ways careful and limited sun exposure could be even more important when you are being treated for cancer! One benefit of getting a little sun is the absorption of vitamin D. A multitude of studies—more than eight hundred overall—have suggested that a deficiency of vitamin D predisposes to several cancers, and in those who already have cancer, survival appears to be lower in those with low vitamin D levels. At the same time, the majority of people in the United States are considered to be deficient in vitamin D.
You've likely heard that you can get vitamin D from dairy products, but in some ways, that is a misnomer. The studies looking at vitamin D for cancer prevention (and for those living with cancer) suggest that the daily intake should be at least 1000 or 2000 international units (IU's). Considering that a glass of milk contains an average of 100 IU's, that's a lot of milk. In contrast, heading outside in slacks and a T shirts on an average sunny day can result in your body absorbing upwards of 5000 IU's in a matter of minutes. If you don't know what your vitamin D level is, talk to your oncologist at your next appointment and ask to have it checked. The usual "normals" for lab results are between 30 and 80 IU's, but make sure to ask about your number, not just whether it is in the normal range or not. Some studies have suggested that a level of 50 or greater may be associated with better survival rates. Talk with your doctor and don't begin taking supplements without her thoughts. Not only can some vitamin and mineral supplements interfere with chemotherapy, but getting too large an amount of vitamin D can result in painful kidney stones. As noted earlier, tanning, especially in a tanning bed, can increase your risk of developing skin cancer. More importantly perhaps when you are going through chemotherapy is that several chemotherapy drugs can increase your sensitivity to the sun. This is referred to as phototoxicity or photosensitivity. Take time to check out this information on which chemotherapy drugs may cause photosensitivity along with tips for enjoying the sun safely during treatment. Many people have realized the hard way that their scalps burn easily following the hair loss that often accompanies chemotherapy. Wear a hat or use sunscreen. Keep in mind that as your hair thins before you completely lose it, you may have much less protection than you had previously. For those who long for that bronzed look during cancer treatment, there is the option of using bronzing powders or creams, although these may cause skin irritation. Spray tans using DHA are not recommended. Not only are these not a good idea for those going through cancer treatment, but there is some evidence that they may cause the genetic changes which can lead to cancer. Tanning pills are not approved by the FDA, and even without adding cancer treatments to the mix, can be unsafe. Tanning during radiation therapy can also have benefits and risks, but the risks depend on the location of your radiation therapy treatments—whether that area will be exposed to the sun or not..
Just as vitamin D is important for those receiving chemotherapy, it is important for people receiving radiation treatment to know their vitamin D levels and talk to their doctors about treatment if they are not in the ideal range. There aren't a lot of studies to prove it, but a benefit of a little sun could definitely be that energy boost you often get with being out in nature (we're not talking tanning booths here, which aren't recommended for anyone.) The most complained about side effect of radiation therapy is fatigue, which tends to get worse throughout treatment. Radiation therapy can cause dryness and redness, sometimes with blisters and even open sores towards the end of treatment. Combining these side effects of radiation therapy with a sunburn (which may be much worse than expected if you are also on a chemotherapy drug which causes phototoxicity) can be a double whammy. There is a reason that the redness and rash that sometimes comes with radiation is often referred to as a radiation burn. While you are in radiation therapy it is important to keep the area where you are being given radiation covered. For example, no bikini bras if you are receiving radiation for breast cancer. With radiation therapy, in addition, some of the skin changes that occur due to a sunburn could become permanent. Both permanent darkening, and permanent stiffness of your skin could result. Unlike those going through chemotherapy, the skin changes from radiation therapy may lead to significant irritation if you are considering bronzing powders and creams. The best bet with tanning is to avoid tanning beds completely. These have been strongly linked to melanoma, and the last thing you want to think about as you go through cancer treatment is having to address another cancer. As far as spending time outside, talk to your doctor. Ask if the chemotherapy drugs you are on will predispose you to sunburns, and what she would recommend for you as far as sun protection. Keep in mind that phototoxicity isn't necessarily preventable with sunscreen. If you are on one of the drugs which causes sun sensitivity, you may need to instead focus on using clothing to protect your skin, or using sunblock. If your oncologist feels you can tolerate the sun safely, ask if it would be okay to wait to apply sunscreen until you have been outside for 10 or 15 minutes to absorb some vitamin D, but regardless of her recommendation, make sure you ask to have your blood level of this cancer fighting vitamin drawn. Though it's not often mentioned, getting a little sun during cancer treatment may actually be a form of treatment, that is, if your vitamin D levels are low. Plus a little sunshine can do wonders for the fatigue, and even cancer-related depression so common during treatment. But caution is in order, especially if you will be receiving a chemotherapy drug which causes photosensitivity or intend to expose radiation treated areas to the sun. Your best bet is to have a good conversation with your oncologist about your own personal risks and benefits with regard to sun exposure. Being your own advocate in your cancer care, for example, in asking about your vitamin D levels, can make a difference in how you cope with treatment, and possibly, even your outcome. Drucker, A., and C. Rosen. Drug-Induced Photosensitivity: Culprit Drugs, Management and Prevention. Drug Safety. 2011. 34(10):821-37. Scaranti, M., Junior Gde, C., and A. Hoff. Vitamin D and Cancer: Does It Really Matter?. Current Opinions in Oncology. 2016. 28(3):205-9.